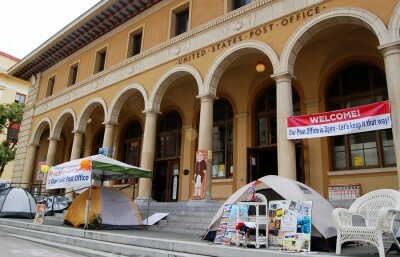 The movement to preserve Downtown Berkeley’s historic post office has garnered national attention, bolstered by a visit from politician and activist Ralph Nader to the post office Tuesday. After an announcement in April of last year, the U.S. 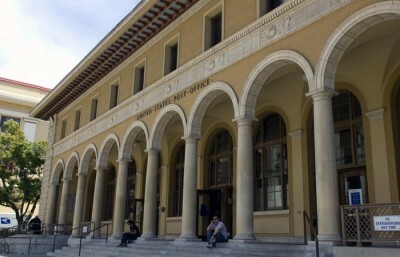 Postal Service is moving forward with plans to sell the building that houses the Downtown post office and may select a buyer as early as December. But proposed municipal legislation would implement a zoning overlay to restrict the use of the building to governmental or public purposes only, rendering commercial operation of the building impossible. 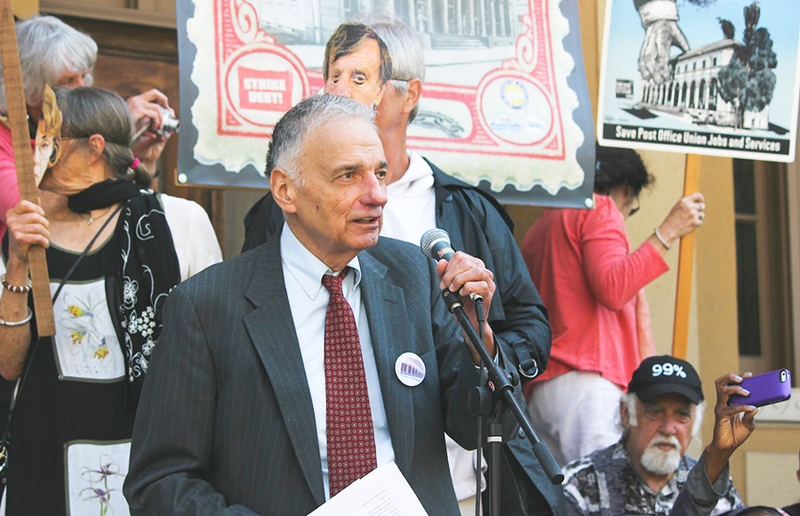 A five-time presidential candidate, Nader called the post office a “fundamental institution that binds the country together” and urged the crowd of onlookers to visit their local senator’s office, write letters in support of the building’s preservation and educate the next generation about the history of the postal service. “When the chips are down and something’s definitely needed for delivery and can’t be delivered over the Internet, what’s left in 32,000 areas around the country?” Nader said at the rally. Councilmember Jesse Arreguin, who authored the zoning overlay, said it would prevent the building from being used for private purposes. The overlay is part of the Green Downtown and Public Commons Initiative, which seeks to benefit the community and limit the height of buildings in certain Downtown areas. Berkeley City Council will review the proposed overlay at its September meeting. 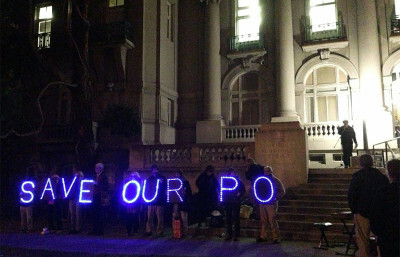 Mayor Tom Bates, who has publicly opposed the initiative but supported the overlay, is confident that the council will marshal its support behind passing the zoning overlay to protect the post office. “It’s a diabolical plan to kill the postal service as we know it, and I’m very proud of our community for doing everything we can to fight it,” Bates said about privatization of post offices. Bates said there is potential for the USPS to pursue litigation in response to the overlay because such an ordinance would hinder the sale and desirability of the building. A spokesperson for USPS, Augustine Ruiz, said the building has a number of interested buyers and will move ahead with the listing regardless of opposing efforts. 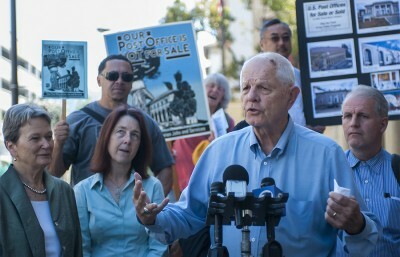 Nader’s public appearance at the post office drew more than 50 supporters, including members of the group Berkeley Post Office Defense. Nader called the notion that the post office is collapsing “propaganda,” demanding that the U.S. Department of the Treasury fund the health and retiree benefits imposed on the USPS in a 2006 law, which mandates that it pay off employee benefits years in advance. Hali Hammer, a member of Save the Berkeley Post Office, played several songs for the crowd. The city’s planning commission will hold a special meeting about the zoning overlay Aug. 27 at the North Berkeley Senior Center. Contact Natalie Meier at [email protected] and follow her on Twitter @nat_meier.